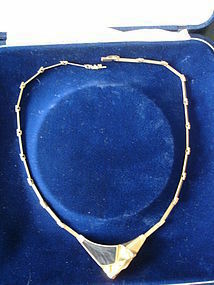 Fabulous Circa 1970 Bjorn Weckstrom for Lapponia 14K 585 Gold Necklace with Black Irridescent Gem inset. It measures appx 14. 5 inches length. Center medallion is just over 1 1/2 inch long. Total weight is a hefty 24.6 grams.Hallmarked 585 the European standard for 14K Gold, Lapponia NS Crown W for Weckstrom and a tiny punchmark I cannot decipher. This was purchased at Georg Jensen and comes in original box which shows some wear, coming apart at seam and missing one latch. Necklace is in Very Good Condition.